I can’t deny it — when it comes to road trips, nothing is more exciting than exploring a new coastline. And when it comes to South Africa’s 2,800-odd kilometers of surf-meets-sand, none is more poignant than the so-called Wild Coast. Covering a magnificent 350-kilometer section of Indian Ocean shoreline in the Eastern Cape, the appropriately named Wild Coast is host to remote beaches, jaw dropping scenery and the Xhosa people. 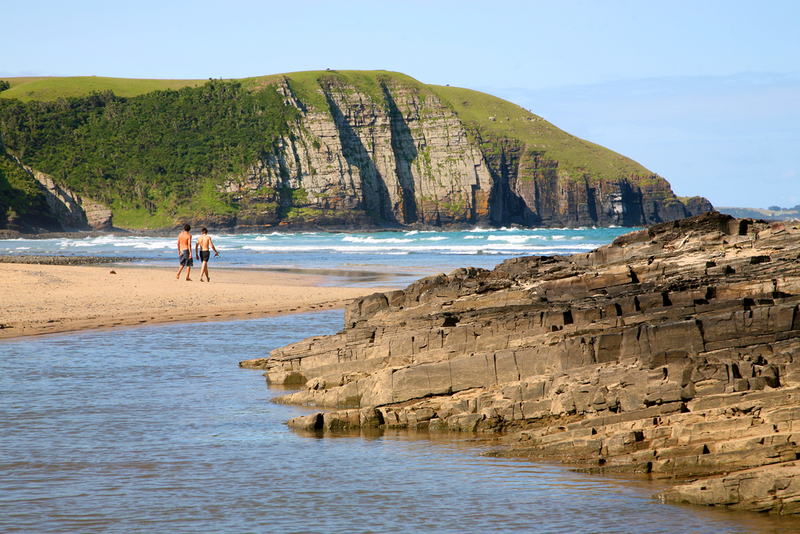 A homeland known as Transkei until the 1990s, this entity no longer exists as a political unit – it is now part of the Eastern Cape – but it still maintains the untamed frontier spirit it has always been known for. Once the forefront of South Africa’s independence struggle, it was home to many of the country’s most renowned freedom fighters, from Thabo Mbeki to Oliver Tambo. It is also hallowed ground: Nelson Mandela was born and buried in this region. I’d suggest beginning a road trip in the west, in the town of Port St Johns, and heading east to Cintsa for a good sample of the region’s secluded warm surf beaches and green subtropical vegetation. 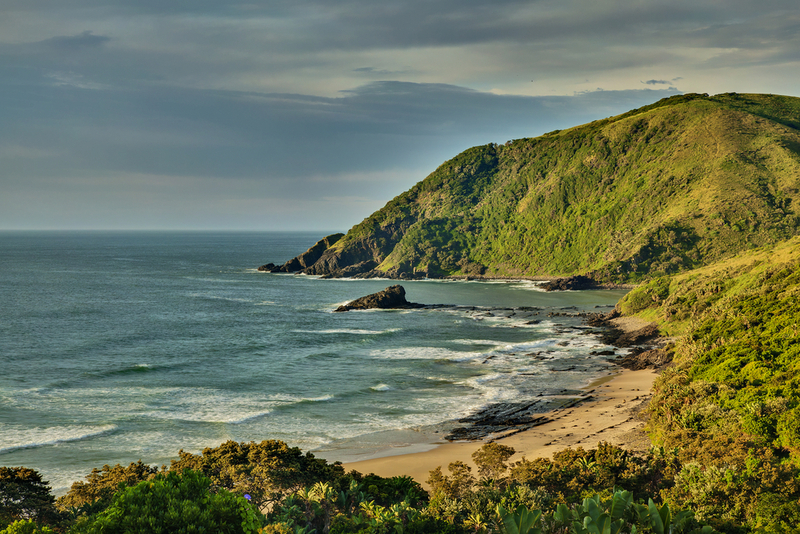 A magnet for hippies, both young and old, Port St Johns is a delightfully traditional little town at the Umzimvubu River’s mouth. Boasting tropical vegetation, dramatic cliffs, great beaches, a relaxed atmosphere and no traffic lights, it is about as close as you’ll come to the new rural South Africa, with a dominant black population in town. Spend the night in the rambling Mtumbane township on the outskirts of town. Industrious local families rent their homes to visitors overnight and it is a unique experience that I found incredibly rewarding – staying with the locals offers a chance at immersion you just don’t find in a hotel. Also in the vicinity of Port St Johns are two excellent nature reserves for hiking along the way: Hluleka and Silaka. Both offer the chance to stretch your legs and stroll through forests of dense green leaves, past jagged cliffs and a rocky coastline filled by tidal pools. Even if you don’t stop, this portion of the drive is beautiful – it’s a land of perky round green hills interspersed with colorful local Xhosa houses and dirt roads where children sell animal sculptures made from wet clay for cents before the roads appear to disappear into the green mouths of old growth forests where the silence is so intense it’s almost panic attack worthy. But before you can panic too hard, the same dirt road emerges from the trees at the edge of a cliff overlooking the immense blueness of the Indian Ocean beyond. 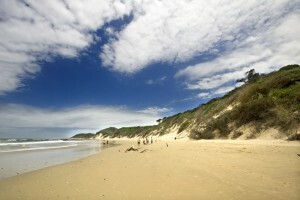 If you’d rather not stay in the township, Port St Johns is also home to an excellent selection of backpackers hostels. To be within walking distance of the main swimming beach, Second Beach, and in the middle of the town’s backpacker social scene, hit up Jungle Monkey or Island Backpackers Lodge. The adjoining properties have a range of en-suite doubles – ask to see a few — many of which are far enough away from the raucous evening chaos to provide mostly quiet sleep (I’ve slept through many a party here). Even if you don’t stay, nearly everyone in town looking to party ends up here at night, as the hostel is known for its popular restaurant and bar where the drinking, dancing and flirting continues well into the night. From Port St Johns you’ll backtrack inland on the R61 – it’s the only way to get back to the coast anyway – to the city of Mthatha (Umtata). There’s no reason to linger in this overgrown African village, so instead continue south on the R61 for another 30-kilometers or so to the village of Qunu, where Nelson Mandela is buried. Although Mandela was born in Mvezo, on the Mbashe River, also in this region, he spent most of his childhood in Qunu. You’ll also find a museum and memorial to the beloved leader here. From Qunu backtrack north slightly to the N2 exit and then head south to about 80-kilometers to your next destination, Coffee Bay. It’s another off-the-grid Wild Coast town where there is little to do beyond worshipping the sun, playing in the surf and just flat out relaxing with a book in the sand. The hostels here (the only accommodation that exists) are big on responsible tourism, both environmental and cultural. Coffee Bay’s beaches are excellent and except for locals fishing on rocks, mostly deserted. There are numerous hikes in the area as well as opportunities to ride horses along the surf. There are a number of stunning walking trails around Coffee Bay and none is more spectacular than heading out to Hole in the Wall, which is an awesome natural hole that has been cut in a cliff-front rock formation by the tide’s endless pounding. Surf splashes through the hole, which is particularly impressive during high tide. Spend a few nights at Bomvu Paradise Backpackers right on the banks of the Bomvu River that’s just off the beach. The region’s first backpackers hostel, founded in 1996, is still one of its best. Calling itself a “holistic hostel,” it is a simple and laid-back place where you can sign up for yoga in the morning and a drum-making class in the afternoon. A meandering compound made up of small buildings with dorms and excellent en-suite rooms (they are really comfy) plus plenty of garden areas to just chill out for the afternoon. I really love the communal dinners here where the emphasis is on organic local fare, and there is a fun camaraderie so often missing from today’s travel scene. At night get ready for fire shows and in-house band drumming sessions while more than a couple joints are passed around. Another one of my favorite South African beach backpackers, the infamous Buccaneers, is your final stop. It’s located in the tiny town of Cintsa, which many argue has the region’s most beautiful beach – which is pretty hard to dispute, as this long white sand crescent juxtaposed against a landscape of green pointy hills and colorful Xhosa houses is pretty stunning. Plus it is home to some decent surfing. Buccaneers, which has options from camping to dorms to private bath doubles, feels like a summer camp for adults: the next day’s activities announced at dinner and a different free activity each afternoon that includes everything from sundowner booze cruises to volleyball. Dinners are huge and often boast T-bone steaks and fish. Guests stick around the bar afterwards and drink the night away. There’s a long secluded swimming beach and boogie boards and canoes are loaned free. Plan to spend a few days here as there is so much to do including taking a surfing lesson (recommended) and joining an overnight trip to a traditional Xhosa village where you’ll stay in a hut with a local family (even more highly recommended). This article was originally published on AFKTravel.com. Want to discover the finer side of Africa? Sign up for the weekly newsletter.